My body is moved mysteriously to the left. Opening my eyes one more time, I see the Renault Scenic receding on my right and realise I’m not dead. My plan had been to take the overnight bus from Brussels to Chamonix and get enough sleep to be able to snowboard the next day. The way things were going I’d get no sleep except that of a more permanent variety. The events described took place in the dark, when my camera wasn’t to hand. Our Polish driver weaved in and out of the Paris bound vehicles on the auto-route for the next ten minutes. There seemed to be only one rule: “Never slow down to below 100 kilometres per hour!” I must have been watching too many movies and could no longer separate the big screen from real life. 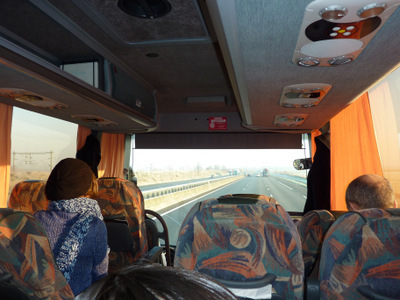 Either way our coach would drive until it was almost touching the vehicle in front, before veering sharply to the left or right depending on where there was a gap large enough to accommodate a 50 seater coach. It didn’t matter whether or not the other traffic was passed on the inside or the offside. After ten minutes of Paris Auto-route dodgems, the driver actually took the decision to lift his foot from the accelerator and depress the brake pedal. The bus slowed down, left the auto-route and eventually negotiated the spiral ramp to the Paris International bus station. We were greeted by armed Police and Customs Officers with a sniffer dog. They boarded the bus and checked our passports before instructing us to get off the bus and remove our bags from the cargo area under the bus. Meanwhile a number of passengers were pulled aside for interrogation. I’m not sure if anyone got arrested but the process was protracted. Eventually, we boarded the bus and departed Paris an hour later than the scheduled time. On this leg of the journey the second driver took the wheel. I watched closely to see if he had also been threatened of dire consequences if he touched the brake pedal. My confidence was restored when he demonstrated driving test book driving skills. Perhaps they had defused the device in Paris? I relaxed and went into the very light overnight bus journey state of sleep expecting to be woken by an announcement over the bus PA system to say that we had pulled into a Service Station for a rest stop and that anyone leaving the bus must return within 10 minutes. Instead, I had a relaxed doze until the Swiss Border. It seems the bus had been delayed so much that the rest stops could not be afforded. Swiss Border Control gave us a repeat of our experience of the Paris Bus Station, except this time we had to wait outside in the freezing night air. Then it was on to Geneva, followed by some more shut eye until I found us climbing the elevated road leading up to the Chamonix valley. I alighted the bus outside Chamonix Train Station at half past eight in the morning as per the timetable. I had managed to arrive having managed enough low quality sleep to go snowboarding. Disclosure: I have travelled on the same service to Chamonix on numerous occasions prior to this, without incident. The most harrowing event being witnessed in a film on the on-board DVD player. If you wish to book a trip on a European Bus service have a look at my Train and Bus page, but be aware that if you book you may not only find a trip to remember for a long time, but if you book using the links identified with an asterisk (*), I might receive a small commission. This entry was posted in Around Europe with ghosts and tagged bus, chamonix, Paris by John Williams. Bookmark the permalink.